our routing because Helen was nervous about being not near enough to our return base to it make in time for hand over. First mate bringing some reason the ambitions of the skipper. This has been a different trip to Greece three years ago where we moved everyday and everyone felt the boat work dominated too much. So we’ve averaged two nights per stop. We set off early (0850 was early!) and had breakfast on the move. 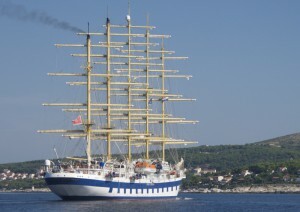 We passed this on the way out of Hvar – looked like just one crew on board! I was hoping to get some decent sailing today but the wind just wasn’t there. We had around 10 knots apparent coming from our port bow but most of that was of our own making (motoring at 6 knots). To test it, we came to a stop and we had around 5 knots but we wouldn’t be able to close haul to our destination. We gave it a try anyway and managed about 2 knots through the water with Harry at the helm. Light wind sailing is the most difficult, I think, and Harry persisted for about 30 minutes. Given the risks of not get a berth at Brna (we had no risk of that, it turned out) we reverted to iron sails and back on with the autopilot. We took 30 minute shifts on the helm, which wasn’t actually steering of course, but keeping a look out. This was by far our quietest passage but still came across lobster pots that could totally screw us if caught in the prop and a few motor and fishing boats. Parking at Brna was tricky despite the entire quay being empty. There was a light enough, but significant, cross wind but the real problem was a concrete ledge protruding at water level which meant it was virtually impossible to fender up and protect the stern. We did a drive by to check it out and then backed up to park. The wind was twisting the boat all over the place and later we moved out and tried again – we didn’t have enough chain out to hold us away. Had a great, but simple lunch, at the nearby café and watched people posing for photos in front of our yacht! Later that night a large gin palace parked next to us (taking the rest of the quay, I hasten to add) and we were consigned to being an annoying distraction for people framing their shots. Cheapest ice cream yet – 50p. Proper Italian quality flavours, decent sized ball,no skimping. 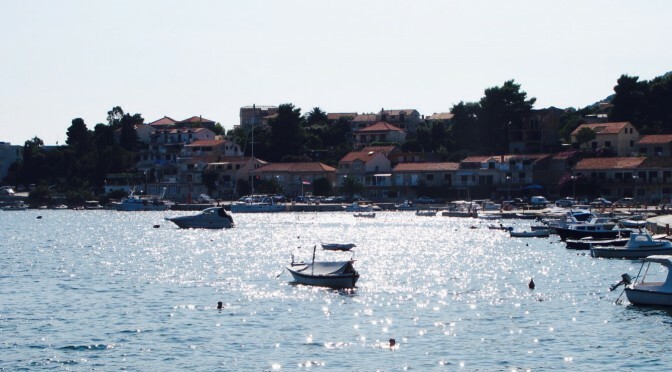 Along with nearly free espresso Croatia has some great ideas. Harbour master stopped by to charge us £40 but at least we now had shore power and water to top up our tanks. He showed me that half is mooring, the rest electric, water and a charge to take away expected rubbish. 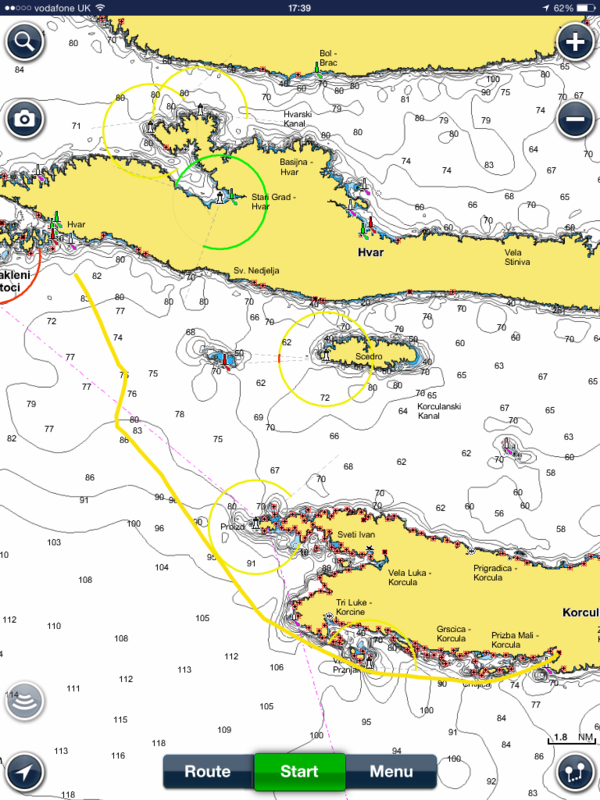 Previous PostHvar Old TownNext PostAn update on our sailing injuries – nothing too serious!